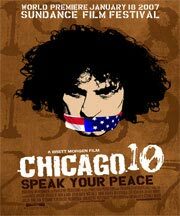 The tone of this year's Sundance Film Festival was established immediately with the Opening Night selection of Brett Morgan's Chicago 10, a partly-animated documentary about the anti-war demonstrations at the 1968 Democratic National Convention in Chicago and the resultant notorious conspiracy trial of 1969. At the opening day press conference Sundance Institute Founder Robert Redford explained the reasoning behind the selection of a documentary to open the fest. "I've had a personal love and interest in documentaries for a long, long time. I thought they should be promoted because the mainstream was not really allowing them any space other than in some academic area. I honestly always believed documentaries would reach a place equal to narrative film and I wanted us to be at the vanguard of that. By opening with Chicago 10 we are really making a statement about that." It wasn't just the documentaries making statements at Sundance. The feature films were more socially and politically aware this year. There were few dysfunctional family films, such as last year's Little Miss Sunshine, and few "coming of age" films. And while there was a wide variety of films (including the wild comedy-horror film Teeth) there were many more features reflecting today's world issues. Among those was Grace is Gone, starring John Cusack as a father dealing with his wife's death in Iraq, which went on to win the Audience Award for best feature. This year's emphasis on socially and politically minded films, both documentaries and features, is most likely a sign of the times. Redford said the "snuffing attempts that have come from the administration" have made Sundance films "more political as a result." He noted "how entertaining a sharp-edged truth can be." Redford announced this year's "Focus on Film" campaign  a slogan that would be seen on buttons available at every official venue. The incredible success of Sundance has brought with it an unwanted commercial aspect  swag, corporate luxury lounges not affiliated with the festival, too much emphasis on the sale of films, etc. Redford said, "It was never intended to be commercial. It was intended to be a place of discovery." He urged the audience not to lose focus on the real reason Sundance exists. This year's emphasis on film as an instrument to social change was also reflected in the festival's panel discussions. Always an important section at Sundance, the panels were expanded this year and were held at four venues: Prospector Square, Sundance House, Filmmaker Lodge, and at New Frontier on Main. Panels of internationally known experts tackled a wide range of topics -- from art to craft to commerce -- with several focusing on the social/political impact of film. The panel How "Movies That Matter" Can Matter was moderated by Helene Cooper of the New York Times. Among the panelists were filmmakers with films at this year's Sundance Film Festival: Sean Fine (co-director of War/Dance), Judith Helfand (producer and co-director of Everything's Cool), Rory Kennedy (director of Ghosts of Abu Ghraib), and Brian Steidle (profiled in the documentary The Devil Came on Horseback). Other panelists included Diane Weyermann ( Exec VP of Documentary Production at Participant Productions), Eric Schlosser (journalist and author of Fast Food Nation) and Gayle Smith (journalist and Senior Fellow at the Center For American Progress). The moderator began by recounting the first time a film moved her to take action for social change. "Back in 1987... I remember walking into a theater to see a movie by Richard Attenborough called Cry Freedom," she said. "It was the story of Stephen Biko, the South African freedom fighter who was arrested and beaten to death in prison... I remember walking out of the movie theater to the student union hall and I signed up for the divest in South Africa movement." "That's what we're here to talk about today," she said. "If movies that matter really do matter, what does it take to become a change agent in our society?" Diane Weyermann said Participant Productions (exec producer of Chicago 10) exists to produce compelling films that inspire social change. She addressed the question of "Do Movies Matter?" by recounting what had occurred since they had launched An Inconvenient Truth at last year's Sundance. "At that time many people still denied global warming existed. We did a bible in case we got attacked on the science and so we were able to answer those people. The film has grossed over forty million and is in thousands of schools across the country. The debate about whether it exists is over. Now the issue is what we can do about it. So this is an example of a movie not just being critical to society, but in this case, to the very future of our planet." Documentary-maker Judith Helfand strongly believes that "linking film to social change is working." She came to Sundance this year with Everything's Cool -- another film about global warming. This is the third film she and her co-filmmakers brought here. After her earlier film Blue Vinyl premiered at Sundance a few years ago, they launched several campaigns, including a postcard campaign against Victoria's Secret using PVC packaging called "Victoria has a Dirty Little Secret." It resulted in that company's commitment to phase out that practice. They have been successful with other companies as well, including Kaiser Permanente which agreed to remove the PVC flooring from their hospitals. With Everything's Cool, they put together an "extreme messaging" campaign with 500 Alaskans spelling out a call to action on the sea ice. While at Sundance they arranged for environmental artist John Quigley to assemble 1000 Park City schoolchildren to spell out an environmental message in the snow and photos were taken from a helicopter and released around the world. Said Helfand, "Sundance is about launching your movie, but for me it's always about launching our movie into a movement." In spite of legislation and promises by their governments, a dozen countries ranging from Afghanistan to Uganda continue to recruit or kidnap children into fighting forces. War/Dance follows the lives of three Ugandan children who were once abducted and forced into the ranks of rebels. Now attending school in the Patongo refugee camp and taking part in a national music and dance competition, the children tell their horrific stories directly to the camera. Sean Fine, who directed War/Dance with his wife Andrea Nix Fine, said they decided to have the story unfold through the children because "we really wanted people to relate to them as their children. We wanted them not to be seen as children 'over there,' but as children who could be in your own backyard." The Devil Came on Horseback concerns the human catastrophe in Darfur and Sudan which has claimed 400,000 lives and displaced 2.5 million people. Marine Captain Brian Steidle went to Sudan as an unarmed military observer working for the African Union. In his 18-month transformation from soldier to observer to witness and activist, he took over 1,000 photos. The film follows his journey. Said Steidle, "I was just a guy who ended up in an extraordinary situation and took pictures." His efforts weren't appreciated by his seniors. "The African Union wasn?t very happy with me." Steidle said he was also contacted by the U.S. State Department and asked to stop on two occasions because of the government's concern he might hinder their ability to gather information in Sudan about Al Quaeda. "If I'd believed I was in any way jeopardizing that I would have stopped." Smith said, "I worked on Africa for thirty years and I can say that it is a much more crowded playing field today than ever before. Finally a spate of films on Africa and these films can do a lot. Both War/Dance and The Devil Came on Horseback tell their stories in a way to make them accessible and that's translating into action. People are finally doing something about it. We are now seeing the largest social movement in Africa since the anti-apartheid movement." Eric (whose novel Fast Food Nation was adapted to film by Richard Linklater) added, "As an investigative journalist I try to bring things to light and try to make people think or maybe to feel. I try to provoke thought as these filmmakers do. But so many films today are designed to just make you feel good. Rick made a film to make you think and unsettle you. Do films matter? Of course they do. But given the way the film industry is structured, and what its values are, it's difficult to get those films made." Filmmaker Rory Kennedy, who came to Sundance this year with her highly anticipated film Ghosts of Abu Ghraib, said it was important that the audience for these films include government figures inside the Beltway. She experienced the value of this with her earlier film, Pandemic: Facing AIDS. "I had the opportunity to show a 20-minute clip of the film to legislators and policy-makers on Capital Hill," she said. "[Vermont Senator Patrick] Leahy came up to me afterwards and said... 'We put an extra $25 million dollars in the budget because of that film.' That doesn't happen every day, but I think it's a concrete example of the impact that film can have in legislation and policy." Diane Weyermann (one of the executive producers of Chicago 10) said, "We're hoping Chicago 10 will inspire younger people to take a stand and participate in democracy. The young people of the anti-war movement in 1968 were non-violent, they were not going to be silenced, and they were willing to take the consequences. We hope this will generate both debate and action in this country." She perhaps spoke for all the filmmakers on the panel when she said, "I believe films have a tremendous power to move people in many ways, including to action. What is key is that people see a film and feel energized or outrage or some powerful emotion to act." The jury and audience award-winners of the 2007 Sundance Film Festival were announced at the Festival's closing Awards Ceremony in Park City, Utah. The films receiving jury awards were selected by distinguished jurors from films screening in the Independent Film Competition and the World Cinema Competition. Awards were given to both dramatic and documentary films screening in the four competitive categories: Documentary Competition, Dramatic Competition, World Cinema Documentary Competition, and World Cinema Dramatic Competition. The films in these categories were also eligible for the 2007 Sundance Film Festival Audience Awards as selected by Film Festival audiences. In addition, the Shorts Jury awarded a Jury Prize in Short Filmmaking to a U.S. and international filmmaker. Other awards recognized at the ceremony include the recipient of the Alfred P. Sloan Prize, awarded to a film which excels in addressing compelling topics in science or technology and the recipients of the Sundance/NHK International Filmmakers Award, created to honor and support emerging filmmakers with their next screenplays. "The films in this year's program have opened up the possibilities of what independent film can be and will be in the future," said Geoffrey Gilmore, Director of the Sundance Film Festival. "The 2007 Sundance Film Festival award-winners reflect the talent, diversity, and evolution of independent film and exemplify the artistic power of film to illuminate and explore issues that are prevalent in our global society." The Independent Film Competition is the heart and soul of the Sundance Film Festival program. It has introduced audiences to many of the best American and international independent films and filmmakers of the past 24 years. Films selected to screen in the Dramatic and Documentary Competitions were eligible for a number of jury awards. The Grand Jury Prize: Documentary was given to Manda Bala (Send a Bullet), directed by Jason Kohn. In Brazil, known as one of the world's most corrupt and violent countries, Manda Bala follows a politician who uses a frog farm to steal billions of dollars, a wealthy businessman who spends a small fortune bulletproofing his cars, and a plastic surgeon who reconstructs the ears of mutilated kidnapping victims. The Grand Jury Prize: Dramatic was given to Padre Nuestro, directed by Christopher Zalla. Fleeing a criminal past, Juan hops a truck transporting illegal immigrants from Mexico to New York City, where he meets Pedro, who is seeking his rich father. The World Cinema Jury Prize: Documentary was given to Enemies Of Happiness (Vores Lykkes Fjender)/Denmark, directed by Eva Mulvad and Anja Al Erhayem. In Enemies Of Happiness, Malalai Joya, a 28-year-old Afghani woman, redefines the role of women and elected officials in her country with her historic 2005 victory in Afghanistan's first democratic parliamentary election in over 30 years. The World Cinema Jury Prize: Dramatic was given to Sweet Mud (Adama Meshugaat)/Israel, directed by Dror Shaul. On a kibbutz in southern Israel in the 1970's, Dvir Avni realizes that his mother is mentally ill. In this closed community, bound by rigid rules, Dvir must navigate between the kibbutz motto of equality and the stinging reality that his mother has, in effect, been abandoned by the community. The Audience Awards are given to both a dramatic and documentary film in the Independent Film Competition as voted by Sundance Film Festival audiences. The 2007 Sundance Film Festival Audience Awards for the Independent Film Competition are presented by Volkswagen of America, Inc. The Audience Award: Documentary was given to Hear and Now, directed by Irene Taylor Brodsky. Brodsky tells a deeply personal story about her deaf parents and their radical decision  after 65 years living together in silence  to undergo cochlear implant surgery, a procedure that could give them the ability to hear. The Audience Award: Dramatic was given to Grace is Gone, directed by James C. Strouse. After learning that his wife has been killed in Iraq, a father finds the courage to tell his daughters the news during a quixotic road trip to an amusement park. The World Cinema Audience Awards are given to both a dramatic and documentary film in the World Cinema Competition as voted by Sundance Film Festival audiences. The World Cinema Audience Award: Documentary was given to In The Shadow of the Moon/United Kingdom, directed by David Sington. One of the defining passages of American history, the Apollo Space Program literally brought the aspirations of a nation to another world. Awe-inspiring footage and candid interviews with the astronauts who visited the moon provide unparalleled perspective on the precious state of our planet. The World Cinema Audience Award: Dramatic was given to Once/Ireland, directed by John Carney. Once is a modern day musical set on the streets of Dublin. Featuring Glen Hansard and his Irish band "The Frames," the film tells the story of a busker and an immigrant during an eventful week as they write, rehearse and record songs that reveal their unique love story. The Directing Awards recognize excellence in directing for dramatic and documentary features. The Directing Award: Documentary went to Sean Fine and Andrea Nix Fine, directors of War/Dance. The Directing Award: Dramatic was presented to Jeffrey Blitz, director of Rocket Science. The Excellence in Cinematography Awards honor exceptional photography in both a dramatic and documentary film at the Festival. Heloisa Passos for Manda Bala (Send A Bullet) from the Documentary Competition and Benoit Debie for Joshua from the Dramatic Competition received the 2007 Cinematography Awards. The Independent Film Competition Documentary Jury presented the Documentary Editing Award to editors Hibah Sherif Frisina, Charlton McMillian, and Michael Schweitzer for their work on the film Nanking. The Jury for the Independent Film Dramatic Competition presents the Waldo Salt Screenwriting Award for outstanding achievement in writing. The 2007 prize was given to James C. Strouse for Grace Is Gone. The Documentary Jury presented a Special Jury Prize to No End in Sight, directed by Charles Ferguson, "in recognition of the film as timely work that clearly illuminates the misguided policy decisions that have led to the catastrophic quagmire of the U.S. invasion and occupation of Iraq." The Jury for the Independent Film Dramatic Competition also presented two special Jury Prizes. Special Jury Prizes for Acting were presented to Jess Weixler in Teeth "for a juicy and jaw-dropping performance" and to Tamara Podemski in Four Sheets to the Wind "for a fully realized physical and emotional turn." The Jury also presented a Special Jury Prize for Singularity of Vision to Chris Smith, director of The Pool. The World Cinema Documentary Competition Jury presented a Special Jury Prize to Hot House/Israel, directed by Shimon Dotan. The World Cinema Dramatic Competition Jury presented a Special Jury Prize to The Legacy (L'heritage)/France directed by Géla Babluani and Temur Babluani. The Shorts Jury presented the Jury Prize in Short Filmmaking to Everything Will Be OK directed by Don Hertzfeldt. The Jury Prize in International Short Filmmaking was given to The Tube With a Hat/Romania, directed by Radu Jude. The Shorts Jury awarded Honorable Mentions in Short Filmmaking to Death To The Tinman, directed by Ray Tintori; The Fighting Cholitas, directed by Mariam Jobrani; Men Understand Each Other Better (Mardha Hamdigar Ra Behtar Mifahmand)/Iran, directed by Marjan Alizadeh; Motodrom/Germany, directed by Joerg Wagner; Spitfire 944 directed by William Lorton; and t.o.m./United Kingdom, directed by Tom Brown and Daniel Gray. The 2007 Sundance Film Festival Short Film Awards are presented by Adobe Systems Incorporated. The Shorts Jury also presented a Special Jury Prize to the documentary short film Freeheld, directed by Cynthia Wade. The 2007 Independent Film Competition Documentary Jurors are Alan Berliner, Lewis Erskine, Lauren Greenfield, Julia Reichert, and Carlos Sandoval. The 2007 Independent Film Competition Dramatic Jurors are Catherine Hardwicke, Dawn Hudson, Pamela Martin, Elvis Mitchell and Sarah Polley. The 2007 World Cinema Competition Documentary Jurors are Raoul Peck, Juan Carlos Rulfo, and Elizabeth Weatherford. The 2007 World Cinema Competition Dramatic Jurors are Carlos Bolado, Lynne Ramsay, and U-Wei Bin Haji Saari. The 2007 Shorts Jurors presenting awards to U.S. and international short films are Jared Hess, Daniela Michel, and Mark Elijah Rosenberg. The Alfred P. Sloan Prize carries a $20,000 cash award and celebrates the work of emerging independent feature filmmakers tackling compelling ideas and issues in science and technology. The 2007 Alfred P. Sloan Prize was presented to Dark Matter, directed by Chen Shi-Zhen. The 2007 Alfred P. Sloan Jurors are Darren Aronofsky, Ann Druyan, Dr. Brian Greene, Howard Suber, and John Underkoffler. Now in its eleventh year, the Sundance/NHK International Filmmakers Award was created to honor and support emerging filmmakers with their next screenplays  one each from the United States, Japan, Europe and Latin America  who possess the originality, talent and vision to be celebrated as we look to the future of international cinema. The winning filmmakers and projects are: Lucía Cedrón, Agnus Dei from Argentina; Caran Hartsfield, Bury Me Standing from the United States; Tomoko Kana, Two by the River from Japan; and Dagur Kári, The Good Heart from Iceland.